The very existence of the Carne Golf Links in County Mayo, Ireland, came as a surprise to John Garrity when he first heard about it in 2002. 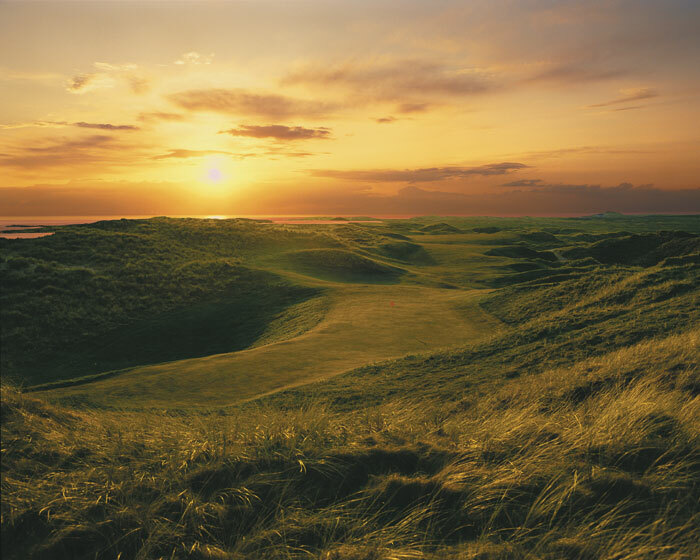 The American course designer, Jim Engh, told Garrity that Carne came in as a close second to Ballybunion as his “favorite golf course in the whole world.” Garrity was even more astonished to learn that Carne was in Belmullet, a town he had not only visited but honored as the embarkation point for his grandfather’s voyage to America in the 19th century. How he had missed discovering Carne was a puzzle Garrity set out to solve during the sojourn he narrates in his wonderful book, Ancestral Links, an edifying rumination on the Irish diaspora. County Mayo. As the locals say, next parish over is Boston. Garrity invited me to join a group of writers on a visit to Belmullet in late July, 2013 to celebrate the opening of nine new holes at Carne. Garrity and several fellow writers arrived in Dublin fresh from witnessing Phil Mickelson’s epic final round at Muirfield, while I came directly to Ireland from Oregon. I’ve been to Ireland many times, but only once before to Mayo, when I had played Ross’s Point and Enniscrone. Carne did not yet exist then, and like most American golfers, I, too, had first learned about Carne by reading Ancestral Links. Tourism Ireland made the arrangements for our group over the next six days, which started with a five hour coach ride from Dublin to Belmullet, interrupted by a stop for a late, long glorious lunch at Mount Falcon, the luxury fishing and hunting lodge in the heart of Mayo. Mount Falcon’s proprietor, Alan Maloney, gave us a tour of the property, enlightening us with a narrative of his restoration work on the manor house that’s now the main lodge, built in the 1870s for a newlywed Anglo-Irish couple whose families then owned thousands of surrounding acres. A beautiful hand-drawn map of the estate’s vast 19th century holdings discovered in the attic graces the wall of Mount Falcon’s reception hall. Maloney described the endless hours required to strip the window sashes, sills, frames and raised-panel shutters from thick layers of paint, and how all of the original wooden flooring had been numbered and removed so that modern plumbing and wiring could be installed, then laid back down and refinished for a classy rustic look. 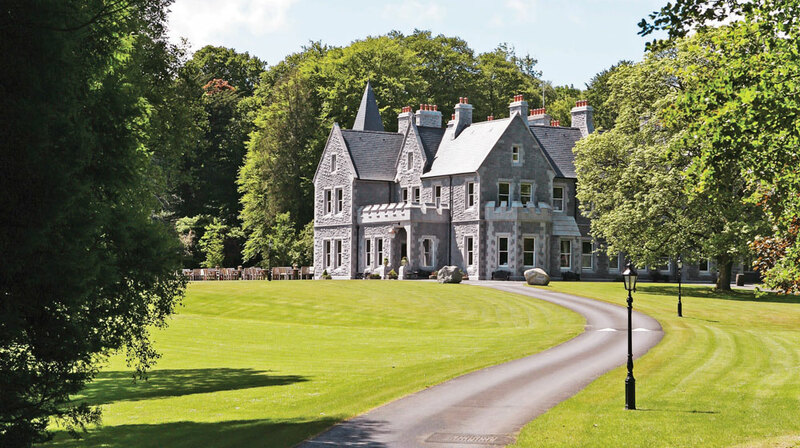 He added a wing in the style of the original manor to bring the number of rooms up to a level that would make operating the hotel feasible, then added a series of cottages back in the woods beyond the estate’s old stone water tower, providing elegant private lodging for families or small groups. The hotel entry looks out over a helicopter pad and a driving range. Mount Falcon sits on a hill west of the River Moy, Ireland’s premier salmon stream. Mount Falcon “owns the fishing rights on a two mile long double bank stretch just a few miles above the tide,” according to Maloney, who explained that a long dry spell—the same weather pattern that had Muirfield playing during the Open more like a winter day in Scottsdale than a July week in Scotland—had also parched the Moy, leaving thousands of salmon idling up north in the estuary above Ballina, waiting for the rain that would fill the river’s banks so the fish could start their spawning run. The Moy descends from the foothills of Sligo’s mountains, running for sixty-eight shallow rippling miles down to the sea. Unlike their Pacific cousins, which can make migrations of hundreds of miles in river systems like the Columbia back to their spawning grounds and then die, the Irish salmon are “iterorapous,” meaning able to make multiple reproductive trips from their natal rivers to the sea and back. That characteristic makes “catch and release” the preferred approach to angling on the Moy. Be kind to your fine scaly friends; that bradán may be somebody’s mother. The rain the Moy needed started falling the next day, coinciding, of course, with our tee times at Carne. The course was showing the effects of the warm, dry weather. It had reached 29 degrees Celsius on four separate days in mid-July, recording what The Irish Meteorological Service projected as the “absolute maximum temperature” for Belmullet. The normal mean daily maximum temperature in July is 17.6, so those mid-July days approaching 30 were very unusual. But when the cool rain did arrive, it helped the Mullet Peninsula revert to its default temperature mode, so we donned the rain gear, opened out the brollies, and started the tramp across Carne’s massive dunes. The fairways were a golden brown, offset by the tea green shoulders of marram-burnished dunes rising above most fairways. The original 18 holes at Carne were designed by Eddie Hackett, the long-time professional at Portmarnock in Dublin and the god-father of modern links golf in Ireland. A picture of Hackett, who helped mid-wife Carne’s birth by offering his services for practically nothing, hangs in the main dining room of the clubhouse. The first nine in Hackett’s design plays through the lower, eastern portions of the site, and with the exception of the second, a par three whose green is partially hidden, the third, a strong par four playing east, and the seventh, an uphill par three with a daunting perched green, the front’s holes play north/south. Although fun to play and well-placed on the site, Carne’s front nine gives only a hint of the challenge that comes when players move west and up into the back nine. But we didn’t play those first nine holes in our “official” opening round, but rather a “composite course” combining the back nine of the Hackett course with nine new holes completed over the last two years under the supervision of a young Scottish architect now resident in Dublin named Ally McIntosh. Hackett had avoided the area where the new holes wind, according to Garrity’s account, because the land was considered too severe. But Jim Engh, who is an overseas member at Carne, did a routing plan showing how in principle nine more holes could be built. Although Engh’s routing plan would be significantly modified by McIntosh, it encouraged the club to create its third nine. Everyone who plays Carne notes that the real genius of the place shows best in the original back nine, which ambles across some of the most dramatic dunescapes anywhere in links golf. Most low-lying dune systems are built by the slow accretions of sand deposited by wave action, then shaped by wind and captured by vegetation, particularly the European dune grasses that root deep and spread by sending out aggressive stolons. The shape of these dunes roughly approximates a sine wave, with regular peaks and valleys and long troughs between the ridges. But at Carne, as McIntosh explained at a banquet following the golf, the Dunes are irregular, with tall peaks thrusting above uneven valley floors, and scarcely a flat spot evident anywhere over 300 or so acres. This dune system spreads along the entire western coast of the Mullet Peninsula, but most has now been fenced off and reserved as private pastures, so the wild dunes at Carne are the last primordial links around Belmullet. The Carne Composite course starts at the Hackett tenth, shown on the card as the first hole. One through seven on the Composite are Hackett’s ten through sixteen. There are two par threes among those first seven holes, both gems tucked into the dunes. The Composite fifth tees off with the sea over the golfer’s shoulder. I had the good fortune to play with Alan Maloney of Mount Falcon, who swings a golf club like the expert fly fisherman he is, and Peter Hynes, an architect who is also the Mayo County Manager. Peter pointed to the islands visible off shore, and narrated the legend of the king’s daughters turned into swans who lived 3oo years on Inishglora. The folklore’s complicated, but the splendor of the view is easy to comprehend. The seventh, a wonderful short par 3 with a green tucked into one of Carne’s hillocks, is the last Hackett hole on the Composite’s front nine. From 8 through 16, we would be playing the McIntosh, or Kilmore 9. Though the turfgrass was spotty, the routing of the Kilmore nestled well into the welcoming arms of its older brother. I will save a fuller critique of the Kilmore for a later post, but I want to compliment Ally and Carne for creating an interesting Composite course that doesn’t obliterate the identity of the original 18, and provides an opportunity for the club to tweak and modify holes which could stand some small improvements while keeping a full 18 always in play. Surviving the walk was the first accomplishment to celebrate at Carne. Even if you hit the ball in the fairway every time, Carne is a taxing walk, and if you hook or slice into the dunes, some vertical adventures to look for lost balls will add to the challenge. Carne’s a ball-eater, but it also yields hidden treasures, so I began to keep score not by strokes but by the number of balls lost and found. I finished my first round two down. We were playing a scramble format, a brilliant way to keep the Americans from obsessing over their medal scores. One should never keep score on a new course with tight fairways, rough above your waist and precipitous greens anyway. We raised a pint of Guinness to celebrate. The second achievement was staying alive and alert until dinner was served. More Guinness helped. A banquet and buffet were scheduled for 7:00, but as our hosts happily pointed out, once off the course our clocks were set to Irish time, meaning the hands were removed from the dial. The sunset was glorious, a citrine glow over the dunes, while the moon lifted above Blacksod Bay. The dignitaries gathered, and a “nine-hole” roster of speakers was introduced by our master of ceremonies, accompanied by a suggestion that each hold to brevity in his or her remarks. There were local and national politicians among the dignitaries, including Ireland’s Minister of State for Sport and Tourism, the Honorable Michael Ring, and a local Mayor named John O’Malley, famous even among a people known for telling stories as an especially gifted raconteur. Though the speeches pushed up dinner until after dark, the mood was good and the celebration sincere. What the good folks at Carne accomplished—and especially Eamon Mangan, whose crucial role in Carne’s original creation Garrity narrates in Ancestral Links, and whose gentle but firm leadership, mostly in the background, has been crucial to Carne’s existence and survival—with a tiny budget and deep reservoirs of perseverance, to create a world-class golf destination is as miraculous in its way as the tale of the children of Lir and the swans of Inishglora. We spent another full day in Belmullet, learning more about Mayo’s past and its rich and enduring links to America. Just as Garrity had come to Belmullet in search of his ancestors, many émigrés from Mayo, or their descendents, have returned to stay. Among these is Mayor O’Malley, who lived in Cleveland, where he met his late wife and where his children were born. A play performed in the local cultural center the next day illuminated the emotional power of these bonds in song and dance. It was an honor to witness such an affectionate connection of its people to a particular place.